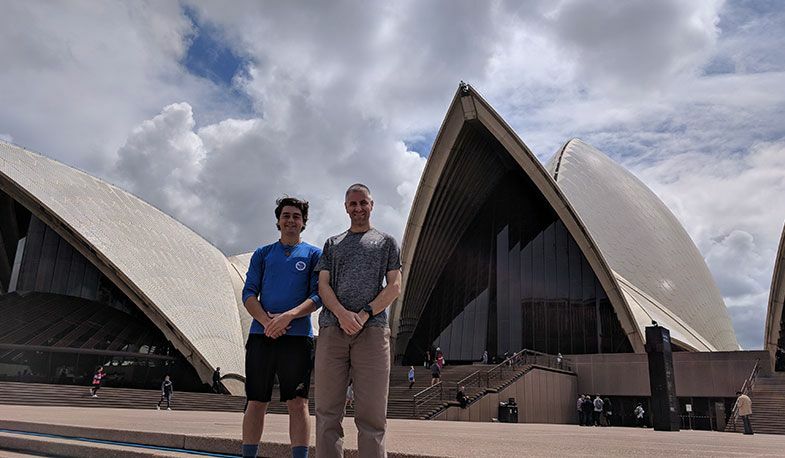 Our Director of Technology & Cyber Science, Mr. Steve Morrill, and senior member of our Cyber Science program, Jake Sanft '19, recently returned from showcasing our Cyber Science program to teachers and students in Australia from October 11–21. They spent time in Alice Springs and Darwin of the Northern Tier conducting teacher and student Cyber Science workshops. We invite you to read Jake's blog below, which does a great job recapping the trip. I got to talk about why I joined Cyber and why I was halfway across the globe. I got to share what I love to do, and I had the opportunity to hopefully inspire and open up paths in these students' lives that they did not know they had available to them previously. We met many awesome people throughout the week, and to paraphrase Dr. Vincent Fitzpatrick, if I reached one of those students, just one, I know the week was successful because it gave them the opportunity to be told that they can do whatever they want to do with their lives. The students who were always told they were only going to be a plumber, a farmer, or a livestock manager for the rest of their lives realized that there are bigger things out there for them, and I am forever grateful that I had the opportunity to be a part of that. This is a day-by-day recount of what happened during our time there. Contrary to popular belief, I did not just hop a plane with no prep time. Rather, we met with the presentation team over Skype several times, and we also got through mountains of paperwork. Lastly, we built the presentations we were going to use while away. We began our trip on Thursday, October 11. As we departed, I was nervous, excited, and anxious. The three-hour delay in Dallas certainly did not help, and we missed our connecting flight to Alice Springs because there is only one flight per day. We landed in Sydney at 8:30 in the morning on Saturday, and once we got to our hotel, we took a cab to downtown Sydney for a little. While there, we saw the Opera House, got lunch, and walked around a street market. The entire day was filled with new experiences and palpable excitement, however, we hit the time zone wall at 4 p.m. and crashed in our hotel rooms before heading to Alice Springs the next day. We arrived back at the Sydney airport around 7:30 a.m. for our 9:30 flight to Alice Springs. While flying to Alice Springs, out the window was like staring upon a Martian desert. It was flat, with no foliage, and just red sand everywhere. Once we got to the Alice Springs airport, we disembarked onto the tarmac and walked into the one-story, five-gate airport with one luggage carousel, and my mom’s luggage did not show up. It got stuck back in Sydney and would arrive the next day because there is only one flight per day from Sydney to Alice Springs. Immediately after walking outside, I was slammed with heat. The normal temperature in Alice Springs this time of year is 90 to 95 degrees. Once we got to our hotel, we realized that they gave our rooms to someone else because we did not check in due to our missed flight. The complicating part was the Masters Games were going on and all of the hotels in the area were booked up. Mr. Morrill got us rooms in Alice Springs and we got to meet two members from LifeJourney—Renee Horeau and Alice Price. LifeJourney and the Northern Tier Government were our main sponsors for this trip and the conferences we attended. After Mr. Morrill, Renee, and Alice got off a conference call with Mr. Phil Scanlan, Chairman of LifeJourney, I joined them and we began talking over slide decks for our presentations later in the week. After three hours of prep, Mr. Morrill, my mom, and I got dinner before heading back to our rooms. We began our day at 5:15 a.m. as we caught our tour bus in Uluru—more commonly known as Ayers Rock—in the middle of the outback. We picked up some people from other hotels before continuing on to breakfast in the center of the center of Australia. There was nothing around for thousands of miles, and there was red sand everywhere. Then we made several stops along the way, including the Kata Tjuta National Park and Ayers Rock itself. Uluru is a major religious centerpiece for the aboriginal people of Australia, and they have explanations for every marking and scratch on the rock. They tell stories of the lizard-man with the blue tongue who fell down the side of the rock while it was so hot his skin was stuck to it. We did not climb the rock because the aboriginals ask all park goers not to out of respect for their religious symbols. After viewing the rock at sunset, we got back to the hotel after midnight and got some sleep before presentations and work the next day. We arrived at Centralian Senior College for our first day of presentations, which is the equivalent of a public high school in the United States. At the school, we met the rest of the presenters for the first time and fixed a busted projector. We began at 9:00 a.m. with a panel discussion, which I served on, and an introduction from the Minister of Education, Selena Uibo. Our first student session started at 9:30. Our first group insisted on sitting in the far back of the classroom, so Mr. Morrill and I looked at each other and said that if they were not going to move up we would just present from back there. All of our presentations were interactive so we got them talking and joking around and ran through four presentations throughout the day. Each section had a couple students who you could tell had their lives transformed. The two who stood out most during this first day was a footie player in the first session and an aboriginal girl in the second session. The boy was someone who was always told that he would just be a meathead athlete and couldn’t do anything smart, so we mentioned the capology program that we implemented in Australia, where you have to help keep the Collingwood footie team under the salary cap. He really seemed to connect with that. The girl went to a boarding school, and it is in their tradition to not ask questions or make eye contact while they are being spoken to. Mr. Morrill and I both could see the passion in her eyes and her desire to learn more. We both talked to her after and told her that she could have a great future and that she would be able to do whatever she wanted to do. Mr. Scanlan then reiterated that to her at the end of the day and again she was so excited. After all the sessions were over, we had a STEM teacher leadership talk where I learned several things. First, the education system is broken all over the world because we teach in silos, secondly that students should be consulted in how education systems work, and lastly that Australia in particular is in trouble because there is lack of alignment between high schools and colleges. Steve Grant, a curriculum director of the Norther Tier, mentioned that getting students involved in the conversation of proper teaching methods and integration will be something he works towards in the future. After this first day of presentaitons, the joy and happiness I felt from changing peoples’ lives helped me understand why teachers do what they do. The excitement on those students’ faces is something I will remember forever. During our second day of presentations, we continued to “go forth and set the world on fire” as St. Ignatius said. Mr. Morrill left for a national radio interview, so I ran our first session alone without him. While it was a challenge, I felt that it went well. I met a student who has seven snakes and five siblings back at her house. I also talked with another student about his opinion on artificial intelligence and if it will take over every job. Then, after morning tea, Mr. Morrill returned and we did the second and third presentations together. We floated the idea to some students of an exchange program with Loyola so that they could nurture their passion for Cyber and then return and teach it at their school. We figured this would be a good idea because our CSI model is being used as a basis for all of Australia, so why not get students involved to teach it. During lunch, Mr. Morrill and I were interviewed by a newspaper, and I challenged some students in a Rubik’s Cube competition, where I lost by 1.5 seconds. Why would they use a Rubik’s Cube to talk about cyber security, you might ask. One word—algorithms. We use algorithms in all sorts of everyday life, but especially in software, which is how we described it. After lunch we gave our last presentation in Alice Springs. Then, it was onward from this Martian Wild West colony to Darwin. After getting to our hotel in Darwin at around 1:30 a.m. due to a delayed flight, we had about five hours of sleep before the next day of presentations were upon us. We made the drive to Charles Darwin University (CDU). After meeting with our government contacts we started running around all morning and figuring out what room we were presenting in, I rewrote the run/schedule sheet for the day twice, and am filled with great confusion. Luckily, everything worked out, and the day went smoothly. We got to work with a lot of 8th graders today and our first and second sessions were awesome. The students were really in tune and Mr. Morrill and I were firing on all cylinders. I raced another student in a rubik’s cube competition, and lost again by three seconds, but I did drop the cube at one point so those three seconds are ceded with a grain of salt on my part. Either way you could see the excitement of all the students watching and the person I was racing. There were a couple of students we had the fortune to run into at the perfect time, as they were teaching themselves some cyber stuff and were beginning to fall toward the illegal side of things. After the presentations of the day, we had a STEM leadership panel, which included teachers, Department of Education leadership, industry experts, and I was lucky enough to be the sole student voice in the room. We talked to Phil Scanlan more, as well as Sharmila Packiaraja, leader of Risk Management for CISM. I consider Loyola a STEM environment because in my opinion, the Jesuits figured out STEM 500 years ago – they just called it education for the mind, body, and spirit. Then we went to Mindil Beach and saw an awesome sunset in addition to a fair that exemplified the cultural diversity of Darwin. There was a place where kids got to play with whips, a shop that sold kangaroo leather, a place where you could hold snakes and birds, as well as foods from so many cuisines it is impossible to count. This was the final day of presentations. We intended to go out with a bang, and that we did. We even got 10 minutes of air time on ABC (Australian Broadcasting Corporation). We also got to meet a ton of awesome kids. There was even one who showed up with a Rubik’s Cube, so when we got to his group, we made him do the presentation on how the algorithms for the cube work while I also got to weave in computer algorithms. I am sure he was frightened at first, but he looked comfortable talking to his peers. We met students who wanted to be airplane mechanics, as well as one who has solved every Rubik’s Cube variation ever placed in front of him. I challenged two kids during lunch, including the one who has solved every cube variation he has come across, and I won. A couple of them asked us if they could come to the States to see our program in action. They want to be the champions of knowledge at their school and do what I got to do and share their passion with as many people as possible. Mr. Morrill and I are looking to draft a proposal about exchange students in the coming weeks, so if there are some Australian students around next year I am excited to say that I had a hand in that. I really hope I get a chance to go back. It was an incredible experience sharing my passion with others. Overall, it was a wonderful experience, and I'm glad I was able to share it with all of you. If anyone has any questions, or would like to hear about my experiences more, feel free to contact me with any questions you may have.